When you push for a few extra miles, your feet will thank you for wearing the SENSE PRO sock. This lightweight ankle-high sock is made from Microlon®, so it’s exceptionally soft and light. A Nanoglide® anti-blister treatment provides relief on the most technical trails. Microlon® feels incredibly soft, even as you push through the last, longest miles of the day. Slide right past the blister phase of your runs. Nanoglide® anti- blister treatment reduces friction for fewer hot spots. Run with the piece of mind that your socks won't bunch up or wrinkle inside your shoes. An arch band keeps everything in its place. Soft, chaffe-free comfort to push extra miles. 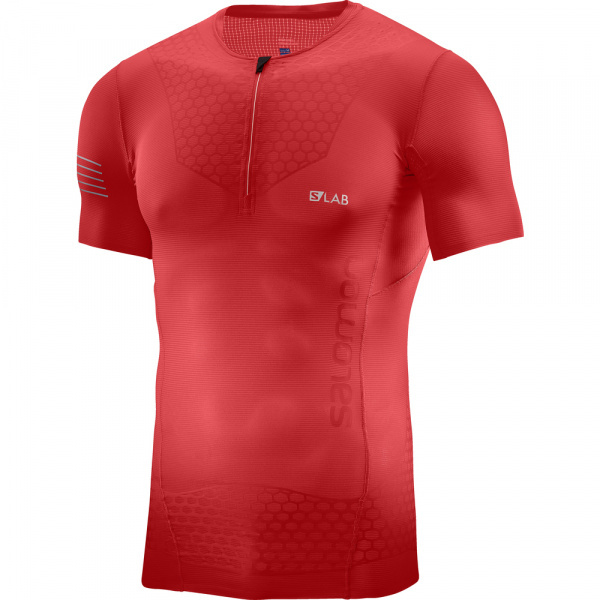 The S/LAB EXO HZ SS TEE delivers optimum performance for committed runners. Lightweight, breathable, and chaffe free. Run faster. A mix of premium fabrics that breathe, dry fast, stay put, don't stink and feel like they're not there - it's a winning combination. It's not a tight cage, it's super efficient construction! With postural support, studied by physios, to be right where you need it. Superlight fabric also dries really fast. Wear it, breathe and run free. A combination of premium fabrics keeps you comfortable and dry.